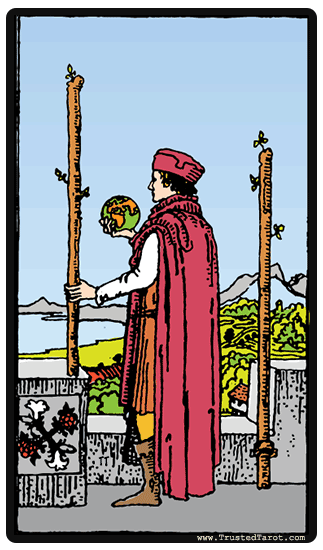 The Two of Wands card features a man standing on top of what looks like a castle and in his right hand he holds a miniature globe. From the way he is standing, the man is looking down upon the vast terrain, in which an ocean lies on the left-hand side, whilst the land stretches over on the right-hand side. The man is wearing an orange tunic and a red hat, symbolizing his enthusiasm towards life itself and hunger for adventure respectively. The miniature globe in his hand represents potential for possible expansion of his reach to broader life experiences. The Two of Wands is a more mature version of the ace of wands, meaning that that this tarot card is all about planning and moving forward – progression. Look at it this way; you have already set out to achieve a particular task, which means you have turned an idea into a realistic plan. Such a plan will require fulfillment and therefore you have to progress from just having the plan to actually achieving what you set out for. Discovery is being considered as another two of wands meaning. This is because it means that you are stepping out of your cocoon and exploring new experiences and worlds. While the beginning might seem tough and difficult, the Two of Wands card encourages you to strive on and push forward. The Two of Wands is a more mature version of the ace of wands, meaning that that this tarot card is all about planning and moving forward – progression. The Two of Wands card also means that you are beginning to realize your objectives and long-term goals before you set out to achieve these objectives. In other words, you have strived to get to where you are and now, moving forward, you have your long-term goals in mind. In summary, the Two of Wands meaning revolves around making decisions. In other words, you are either satisfied with your current knowledge, or you are moving forward and taking risks. It means, leaving our comfort zones and exploring new territory. The Two of Wands reversed meaning suggests the need to set up long-term goals. Begin the process of setting up your goals by identifying what to you is important. Proceed by planning how you intend on achieving such goals. Another Two of Wands reversal meaning suggests that you have ignored important fine points associated with planning your future. Lack of proper planning could be the reason for your downfall. Other interpretations can include either overconfidence or lack of patience, both are possible in bringing you disarray in your path forward.